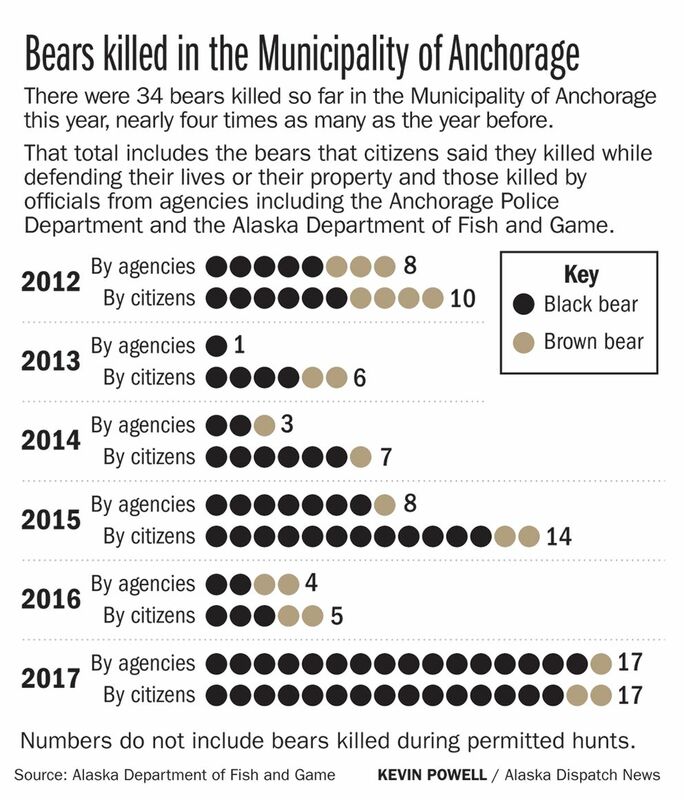 So far in 2017, 34 bears have been shot to death in the Municipality of Anchorage, a vast area that spans from Eklutna to Portage and includes many thousands of acres of wilderness. Half of the bears were killed by people who said they were defending their lives or their property. The other half were killed by police, park rangers or wildlife biologists. Dave Battle, the Anchorage-area wildlife biologist for the Alaska Department of Fish and Game, said this year's tally of bear kills is among the highest ever recorded in the municipality. It's nearly four times more than last year's total. "We had light years the past few years," Battle said. "Then this year we just kind of had an explosion." So what caused the spike in bear kills? There's no single answer, Battle said, but there are theories. One of them: After the fatal mauling of a 16-year-old on Bird Ridge, some people just became less tolerant of bears. For each bear killed in 2017, Fish and Game provided Alaska Dispatch News with a brief summary of the circumstances. 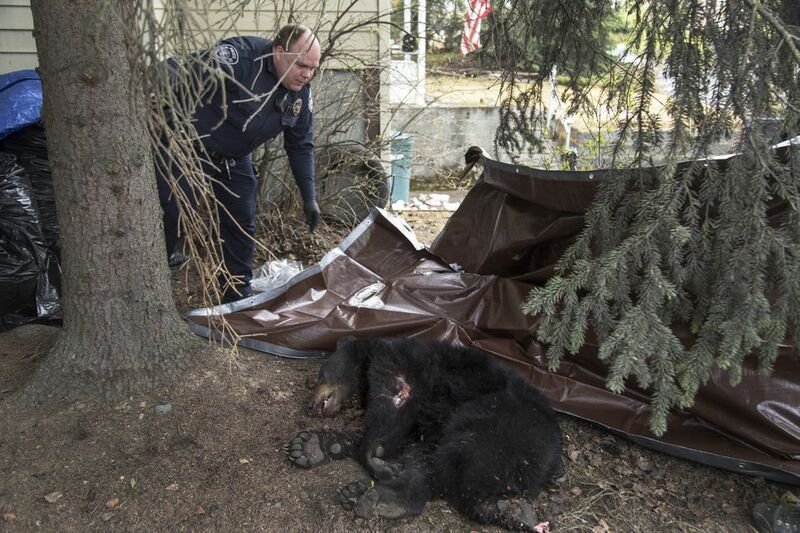 In May, an Anchorage police officer killed a black bear that dug through trash and charged two elderly women in East Anchorage. 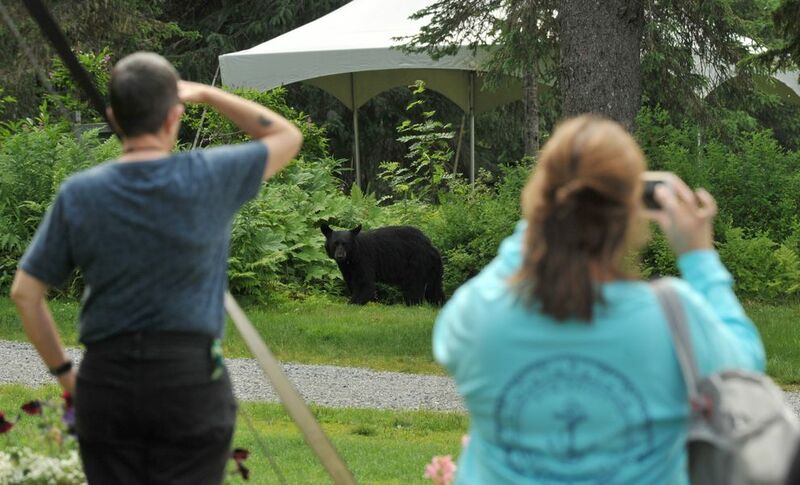 In July, an Eagle River resident shot and killed a black bear that "attempted to break in." In October, police from Ted Stevens Anchorage International Airport shot a bear that walked into the airport post office and wouldn't leave. 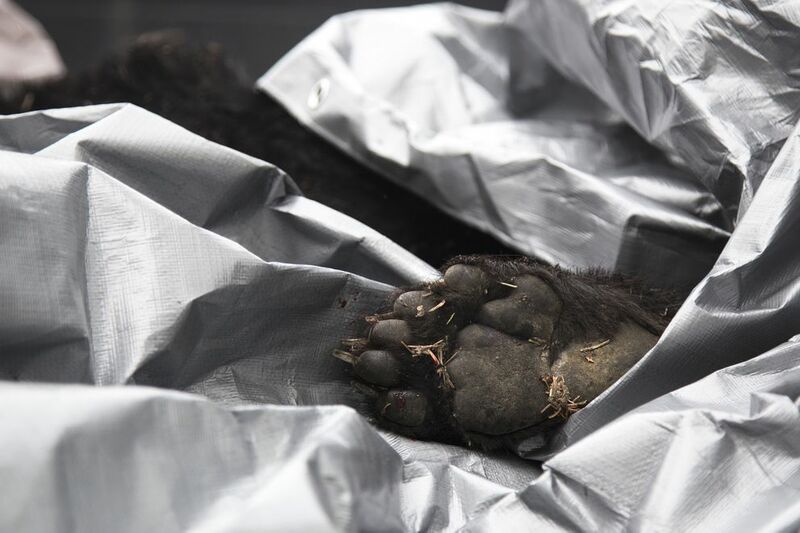 The bear's stomach was filled with candy wrappers, according to an assistant professor at the University of Alaska Anchorage who is using the carcass in his forensics class. Some other bears were shot after they broke into chicken coops. One bear attacked two orphaned moose calves at a rescue facility on the Anchorage Hillside. Another bear ate candy that a youth camp had hidden outside for its attendees to find. "It wouldn't leave," Battle said of the black bear near the Chugiak camp. "They kept trying to scare it away. It had found some food just lying around in the woods and so it just kept coming back for more." Many of the bears were killed in less-populated areas of Eagle River, Girdwood and the Hillside. There wasn't a consistent pattern in the kills. But many had to do with trash. "I would bet good money that trash was a factor in almost anything that happened in a neighborhood," Battle said. "Trash is, I think, always the No. 1 factor in this town for bear conflicts." Once a bear knows where to find trash, it will often return, Battle said. Ken Marsh, a Fish and Game spokesman, said relocating the bears that have raided trash or charged humans is expensive, time-consuming and often doesn't work. In 2015, it cost nearly $10,000 to relocate a black bear sow with cubs from Government Hill to the Kenai National Wildlife Refuge. The bears were later spotted in the town of Hope, where they continued to dig into trash and killed a few chickens. Officials eventually shot four of the five relocated bears after one reportedly got into a vehicle. 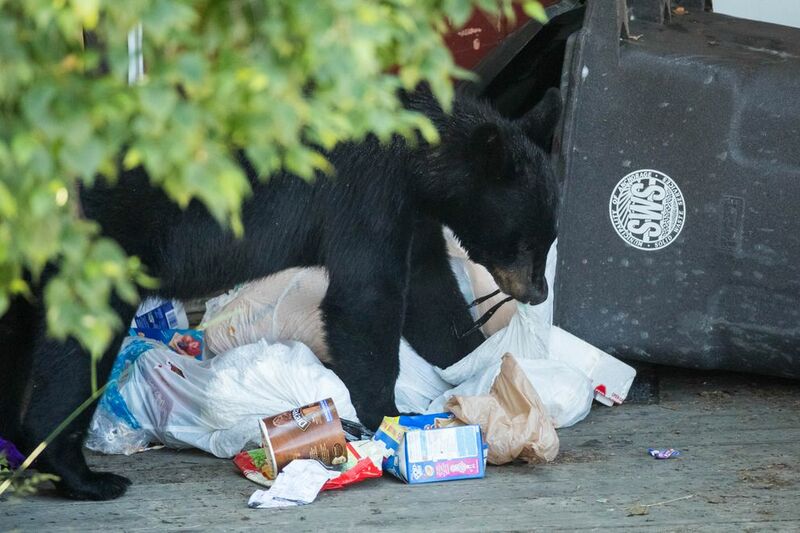 "Generally speaking, when you have bears getting into trash and creating problems in an urban situation, it can be very difficult and expensive to dart and relocate them and so often it's not successful," Marsh said. Fish and Game does try to find homes for orphaned cubs, he said, but there isn't always space. This past summer, two sows with cubs were killed — one in Girdwood and one on Joint Base Elmendorf-Richardson. Then wildlife biologists had to kill the five orphaned cubs. "We try to find captive placement for every one that we can. We have our permitting officer canvassing facilities nationwide," Battle said. "There's only so much placement for them." 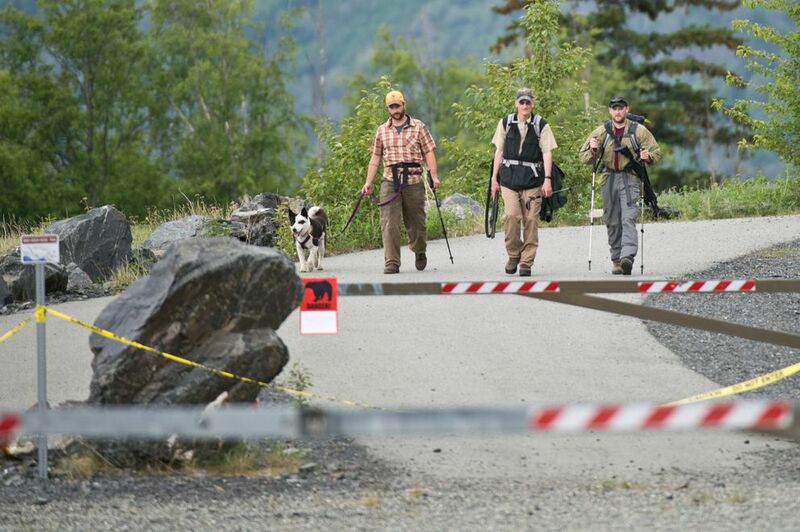 Wildlife biologists also shot and killed four black bears in the Bird Ridge area this summer after a 16-year-old Anchorage runner, Patrick "Jack" Cooper, was fatally mauled during a mountain race June 18. It was the first fatal mauling in the Anchorage area in more than 20 years. A day later and hundreds of miles away, in Interior Alaska, 27-year-old Erin Johnson was killed by a black bear while doing contract work at the Pogo Mine. The news of the back-to-back deadly attacks may have put some Alaskans on edge, leading to more bear shootings, Battle said. "It could have caused people to just be a bit less tolerant of black bears in their neighborhoods," he said. Battle said he also wondered if the constant stream of online posts about bear sightings in and around the city this summer, especially on Facebook and Nextdoor, stoked fear and led to more calls about nearby bears. "It was very difficult to keep up with all the reports," Battle said. It's also possible that there are just more bears around, he said. Some Alaskans believe that's the case. At the Alaska Native Heritage Center, in northeast Anchorage, the staff is upgrading its fence to better keep bears out after a summer filled with wildlife, said Rick Irwin, the center's director of facilities, transportation and safety. "We were just inundated with bears this summer. It was way worse than it's ever been," he said. "It was just crazy." Sam Daniel, who serves on the Girdwood Board of Supervisors, said the community typically has one or two "problem bears" each summer, but this year there were at least eight. He spotted them on the bike path, in his driveway and walking through his yard. "There are a lot more bears, and I mean it's astronomical," he said. The overall bear population typically does not balloon quickly because bears "don't reproduce that fast," Battle said. Since Fish and Game doesn't have a scientific census of bears in the municipality, Battle said he couldn't say for sure whether more bears wandered through the area this year or not. However, judging by the number of bear reports Fish and Game received, he said, "It seemed like there were more bears in town." Perhaps, he said, more bears entered populated areas this year because they knew they could find trash to eat. Or maybe it had something to do with the salmon runs or some other issue with a food source. Maybe the bears chased moose calves into town and then found trash. Maybe new residents moved into a neighborhood and weren't used to seeing bears. Battle couldn't say for sure. "We're kind of speculating on some of this stuff," he said. "We don't have a good way to measure what exactly was the thing here." When a bear is killed by a resident in defense of life or property or by an agency like Fish and Game, the carcass can go to one of several places. If the meat is still fresh, Fish and Game staff start calling a list of Alaskans interested in salvaging it. "If the meat is fresh, I've never not been able to find a salvager," Battle said. The hide is fleshed and salted and then stored until it goes in front of a crowd at the annual Fur Rendezvous Hide and Horn Auction in downtown Anchorage. Fish and Game keeps bears' skulls for educational purposes, according to Marsh. If the meat isn't fresh, the bear carcass either goes to the dump or, recently, to UAA. Ryan Harrod, an assistant professor at UAA, uses the bear carcasses in his forensics class as substitutes for human corpses. Bones in a bear paw, he said, look a lot like those in a human hand. 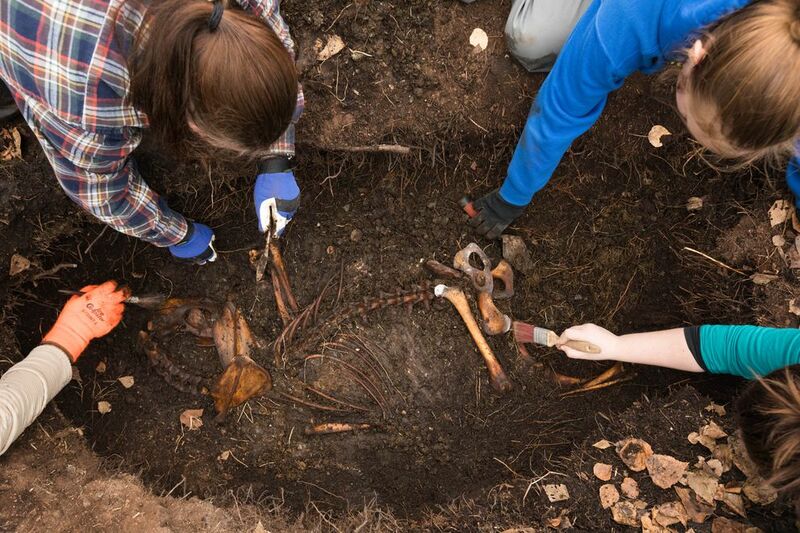 Harrod buries the bears outside so his students can later dig them up and examine them, like investigators at a crime scene. "Then we'll clean the bones and put them into a collection," he said. The bones, he said, go to the Alaska Consortium of Zooarchaeologists, which houses its collection at UAA for use in research or in classrooms. "They're used for science throughout the whole process," he said.